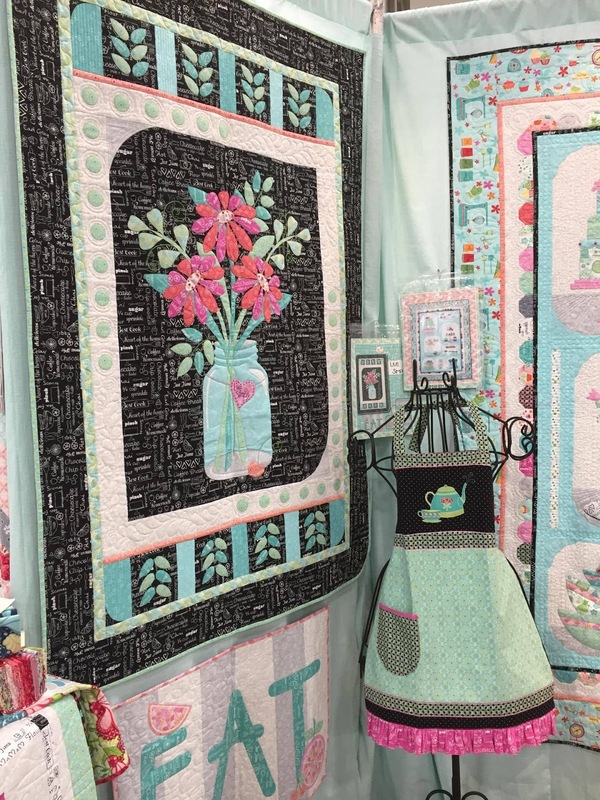 Welcome to day 1 of our three-day Quilt Market booth tour. 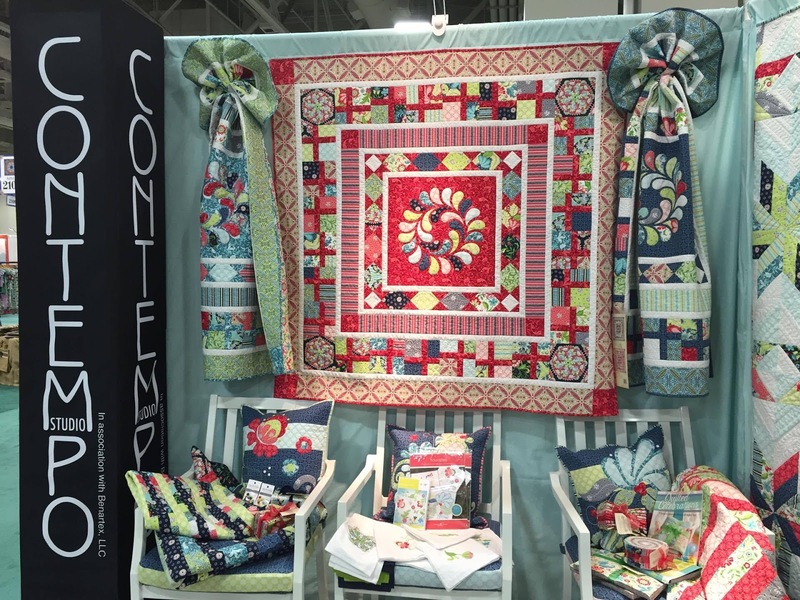 Last weekend, we were in Salt Lake City sharing our newest fabric collections from Benartex, Kanvas and Contempo with quilt shop owners. 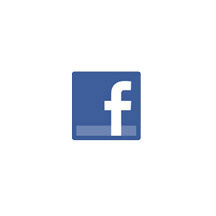 Now we're ready to give you a sneak peek so you know what to watch for (and ask for!) at your local quilt shops. Cherry in her booth. 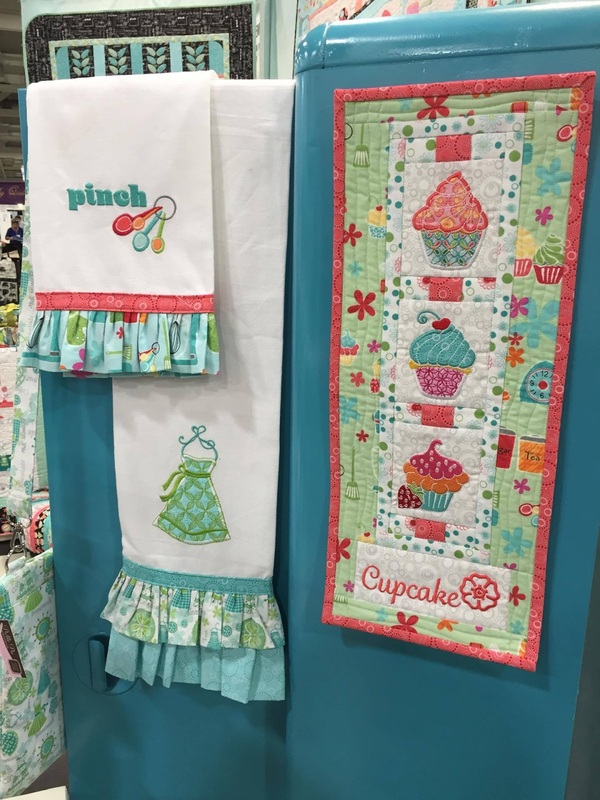 Her new collection, Kitchen Love, is exactly what the name suggests: lots of love for all things kitchen-related! 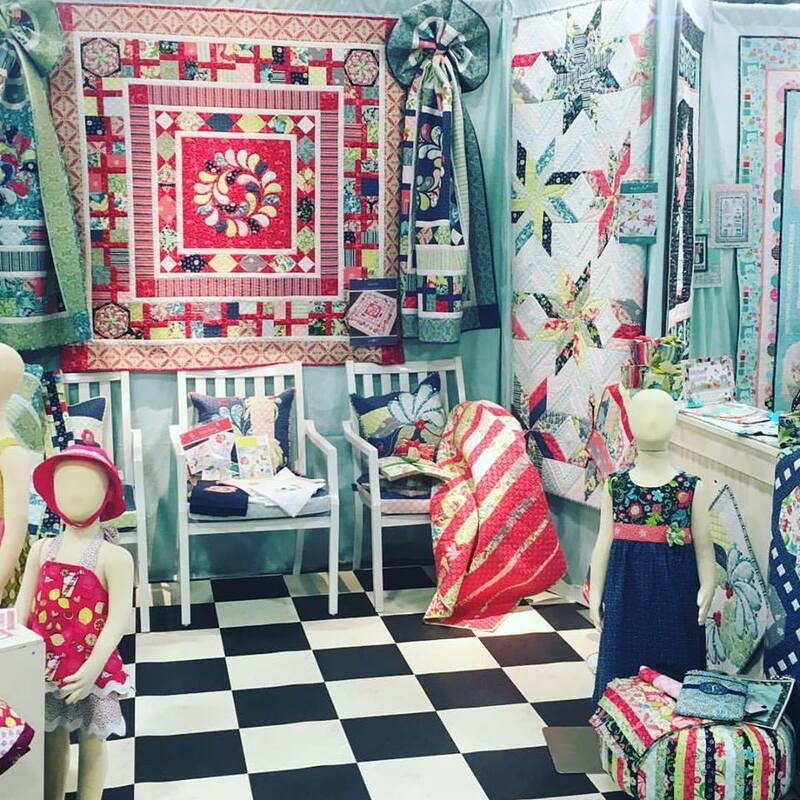 And of course, with Cherry, you'll see plenty of whimsical applique and embroidery work as well. 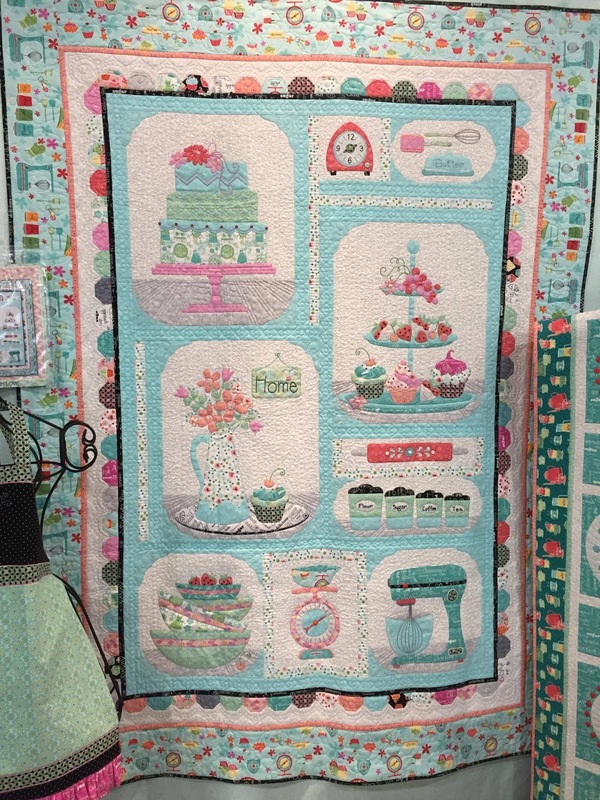 Love the main quilt in the booth--so much detailed and beautiful applique and embroidery design! 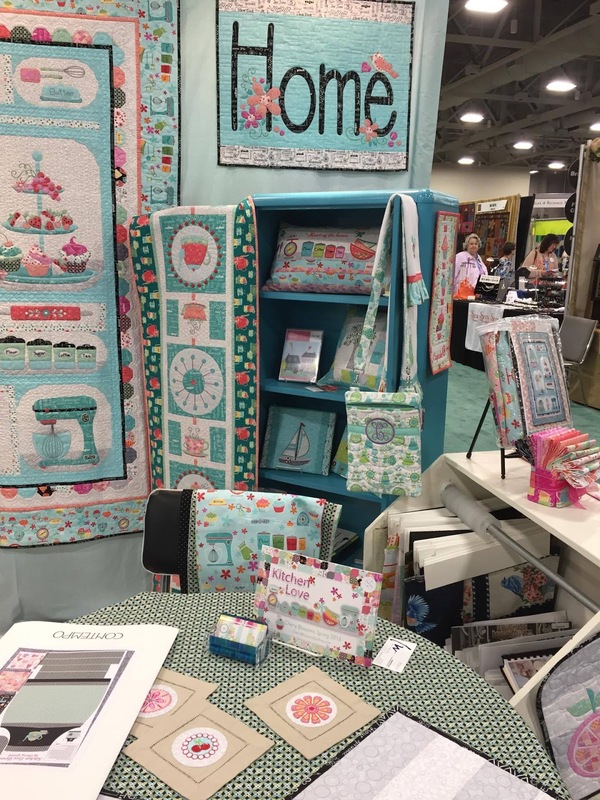 Click here to see the fabrics in Cherry's Kitchen Love collection. Available in shops August/September. Next up is Amanda Murphy's new collection, Feathers & Flourishes. This line features Amanda's well-loved feathers and flourishes, as well as intricate medallions! Don't forget dots, a fancy stripe, and geometric prints--great coordinates or stand alone prints. 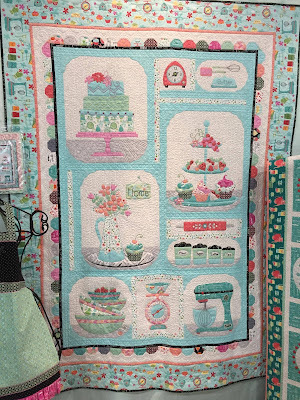 And a closer look at this medallion-style quilt, built out from an appliqued center motif. 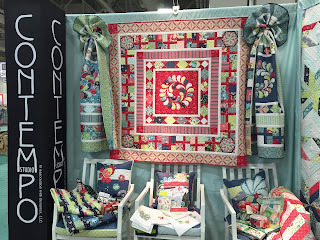 Quilts, pillows, sundresses, a sunhat, a tuffet...so much fun! 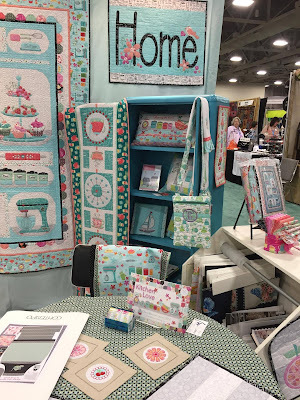 Click here to see the fabrics in Amanda's Feathers & Flourishes collection. Available in shops July/August! And last but not least, Lemon Squeezy by Holly Helgeson! This summery line is full of lime, bright pinks, and happy yellows. The prints include lemons (obviously!) 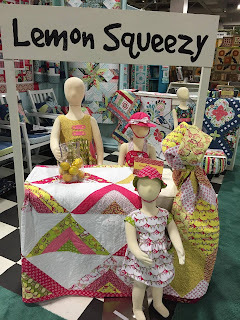 and lemonade, but also an adorable pennant print, text print, and a cool chevron stripe. 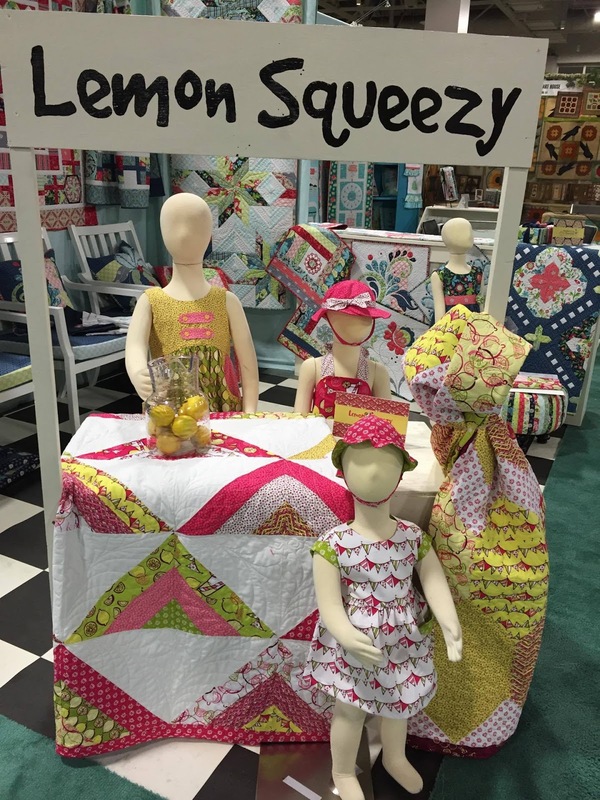 Think of Lemon Squeezy as an upgrade on your childhood lemonade stand ambitions. 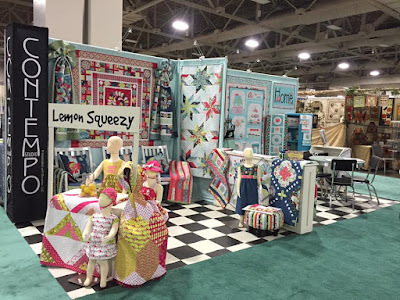 Click here to see the fabrics in Holly's Lemon Squeezy collection. Available in shops June/July. Check back tomorrow, when we'll continue our Quilt Market booth tour. Great Market booth tour. 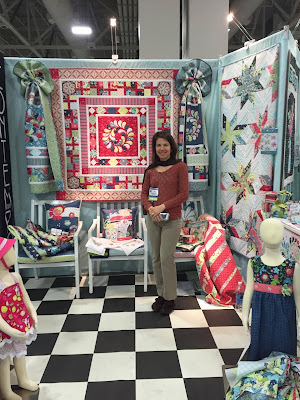 So inviting with lovely projects, fabrics, color and welcoming smiles. I'm particularly drawn to Cherry's Kitchen Love collection, but all these new lines are gorgeous. Lovely projects. 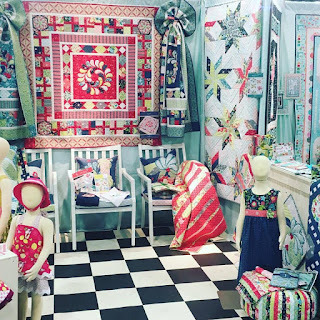 Beautiful booth. Thank you for showing us. Both of these collections are delightful. I adore the text print in Kitchen Love. Thank you for posting these photos, I so wish we could have attended!!!! 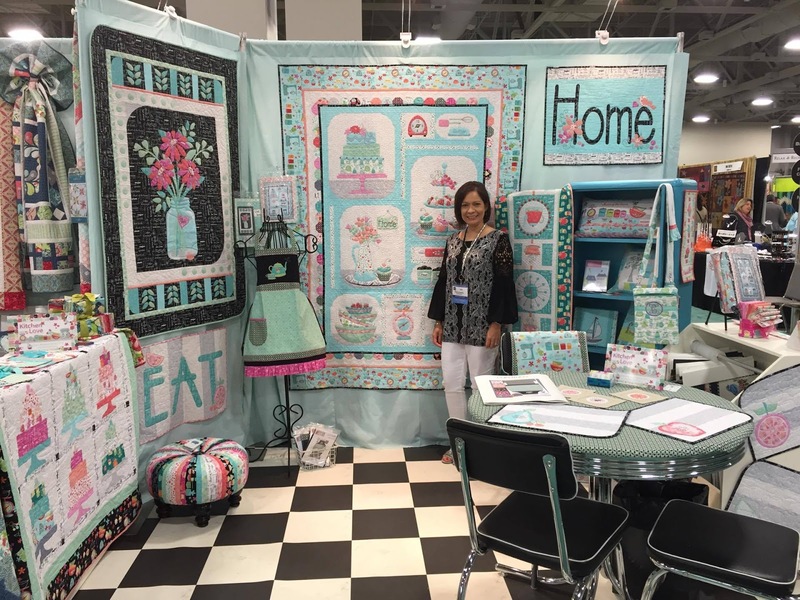 Love the Kanvas booth!!! !